Inspired by the mystery, enchantment and beauty of Wonderland, today's Wedding Cake Wednesday feature is an Alice lover's delight. 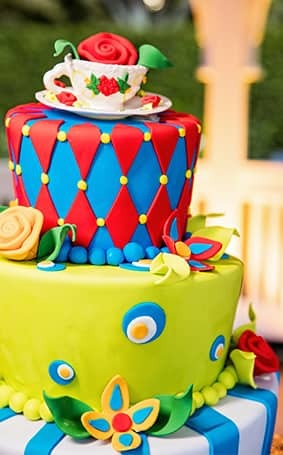 Tumble down the rabbit hole for a fantastical, imaginative cake bursting with vibrant blues, greens and reds. 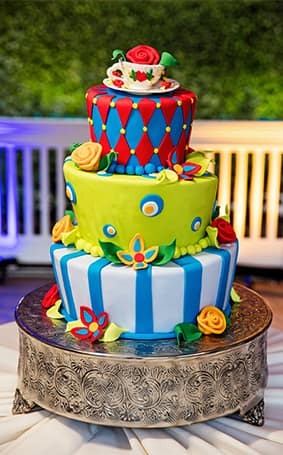 Of course no proper Alice in Wonderland inspired cake is complete without the perfect teacup topper to adorn the masterpiece.